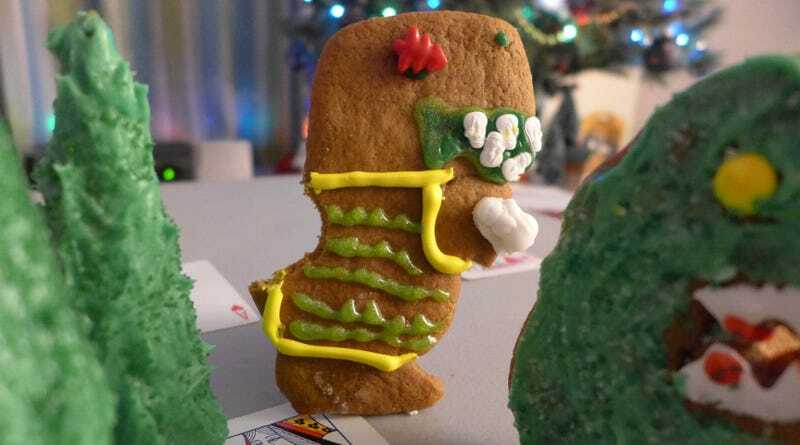 I can't imagine anyone disliking Rogue Genius' Gingerbread Kaiju, because even if you're not into city-stomping strategy games or somehow hate giant monsters, eating tasty gingerbread cookies and piles of candy are literally part of the game's rules. Gingerbread Kaiju is a game about giant monsters fighting each other while destroying Tokyo. But the monsters are made of gingerbread, and the city is made of candy. How's that for an elevator pitch? This is the first game I've ever reviewed that has a recipe in the appendix. As the game's creators note, character creation in Gingerbread Kaiju is a bit more involved and time-consuming than it is for most games, since you have to actually bake your character from scratch. Luckily, the gingerbread recipe they included is simple and makes some very yummy dough. Don't think that this is just a gag game — some serious thought has gone into the rules, which are not only fun to play, they include tons of references to classic kaiju film tropes. There's a card called Tiny Singing Women, and one called Psychic Kid. You can even attack enemy monsters with maser tanks, and everyone knows it ain't a kaiju party until the masers show up. (Yes, that's Mothra in both forms). To lay out the game board, you separate a regular deck of 54 cards (counting two jokers) into two piles, one with all the 10s, Jacks, Queens, Kings, and Aces, one with the rest of the cards. The face cards are shuffled and laid out face down in a five by four grid. This represents the city of Tokyo, and each card represents a "ward" or area of the city. As your monster stomps its way through Tokyo, you flip over a card and check a chart to see what it is, how many buildings, people, and equipment you find there, and any other effects the ward has. All of these game elements are represented by candy. You can use whatever you like — in our case, we made waffle cone trees for buildings and used Rolos for equipment, with jellybeans acting as people. When a monster stomps a part of a city, it gains control of these resources, which it can then spend to play karma cards. The karma cards represent military attacks, the arrival of invading aliens (in their cookie UFOs) and other effects. When monsters meet, they bite each other or use other special attacks. Damage to an enemy monster and you destroy some of the resources it's gathered, in which case you eat them. Do enough damage and you'll destroy one of the monster's body parts, which you also eat (and which eliminates any special powers attached to that body part). The game includes templates for eight different gingerbread kaiju, plus their in-game stats. These were all funny parodies of well-known kaiju, but I ended up calling all of them by their "real" names. It's easy to create your own kaiju as well. We had some cookie cutters, so we made UltraGinger MegaBread Man, Mecha-Squirrel, and Atomo the Giant Teddy Bear. There's a menu of special powers you can give out. Of course, a big part of the fun is baking and decorating the kaiju. This could be a really fun family holiday activity. You'll want a variety of candies and frostings to give your kaiju some expression, and to show off their weaponry (I'm pretty proud of my version of Jet Jaguar's candy-cane arm cannons). Gingerbread Kaiju is available in pdf form at DriveThruRPG. I'd love to see a deluxe version some day, with print-and-play cards to represent the city and the karma cards.